The “Billionaire’s Primary”: Meet America’s New Political Bosses | The “Billionaire’s Primary”: Meet America’s New Political Bosses – The Republic of T.
Republicans even called it “the Sheldon Primary.”Adelson granted audience to GOP presidential hopefuls at the spring meeting of the Republican Jewish Coalition, in Las Vegas. Over the course of four days of Scotch tastings, golf, poker tournaments, and private meetings, the 80-year-old casino mogul examined the GOP’s most likely 2016 presidential candidates. Adelson single-handedly kept Newt Gingrich in the 2012 presidential race, with nearly $16 million in campaign contributions, some of which financed Gingrich’s infamous documentary, “When Mitt Romney Came To Town.” When Gingrich ran out of hot air, Adelson poured more than $30 million into Romney’s campaign. Whoever wins Adelson’s support will have his billions behind them in 2016. The “Billionaire’s Primary” is a return to what Paul Krugman calls “patrimonial capitalism,” where a wealthy few control the “commanding heights of the economy, and use their wealth to influence politics. Thanks to the biggest wealth transfer in U.S. history, the rich are richer than ever. And, thanks to the Supreme Court’s Citizen’s United decision, there’s no limit on what they can spend. The new billionaire political bosses aren’t limiting themselves to national politics. 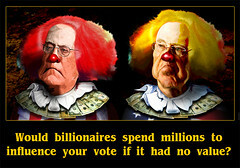 Charles and David Koch made the top 10 in Forbesmagazine’s list of the wealthiest people on the planet. According to a George Washington University Battleground poll, most Americans have never heard of the Koch brothers, but the Koch’s wealth is “trickling down” into local politics. Along with spending tens of millions of dollars on 2014 Senate races, the Washington Post reports that the Kochs are funneling money into “hyperlocal” races, through their Americans For Prosperity organization. The Wisconsin chapter is engaged in an Iron County board election, challenging incumbents as “anti-mining” radicals, and distributing 1,000 flyers in a county with just 5,000 voting age residents. AFP is also involved in a local race in Iowa, and property tax fights in Kansas, Ohio, and Texas. This is nothing new. It’s a time-honored strategy, rooted in the notion that, “all politics is local.” It worked well for Ralph Reed and the Christian Coalition in the 80s and 90s. Now billionaires are using this strategy, but to what ends, and what are the implications for American politics? Right-wing billionaires are building their own political machines, to promote their personal interests and preserve their profits. The Koch brothers have poured millions in to campaigns against Obamacare and climate science, as part of a broader campaign against government regulation — which they perceive as a threat to their fossil fuel stock investments and personal fortunes. Adelson will do “whatever it takes” to stop internet gambling, to protect the profit margins of his casinos. He’s hired former Democratic senator Blanche Lincoln’s government consulting firm to lobby for his Vegas corporation. Though not a long-time supporter, Adelson has given Sen. Lindsey Graham (R, SC) $15,600 in campaign contributions. Graham reportedly preparing a bill to ban internet gambling. Adelson and the Kochs show how the wealthy can use their wealth — in a post-Citizens United political landscape — to impact races and shape policy. Their fire-hoses of money can easily drown out other messages, and narrow the field of candidates for office. The cost of running for office increasingly requires candidates have personal wealth, or wealthy patrons. Those who have neither almost need not apply, even at the state and local level. Billionaire political bosses like Adelson and the Kochs are America’s new oligarchs. Political parties may at least be influenced by public opinion, but American oligarchs act in their self-interest without concern for public sentiment. They are accountable to no one, and the lawmakers on their payrolls are more accountable to their billionaire political bosses than to the rest of the American electorate.